Exhibition took place 20 July - 13 October 2013 in the Art Gallery. This major retrospective of works by George Howard (1843 – 1911), 9th Earl of Carlisle, explores his lifelong dedication to the arts, both as an important artist and a significant patron. The exhibition charts Howard’s artistic development and patronage through a rich and varied selection of over 100 art works. 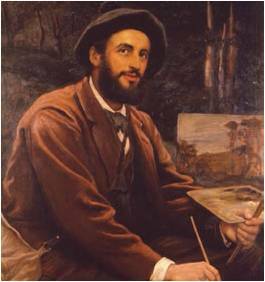 The thematic display reveals his love of landscape both at home and abroad, where his travels extended to destinations such as India, Egypt and South Africa. It also includes affectionate sketches of Howard’s children and family life, and pencil portraits of key figures in Victorian society. Howard’s involvement with the Pre-raphaelite group of artists, particularly Edward Burne-Jones and William Morris, and his role as one of the great patrons of the period is also explored. Examples of his considerable patronage in Cumbria are a particular highlight of the exhibition. Most of the works are on loan from public and private collections, many of which have not been on public display before. Portrait of George Howard, 9th Earl of Carlisle (1843-1911), 1879 by William Blake Richmond. From the Castle Howard Collection. 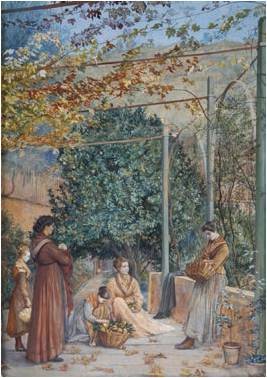 Rest in the Pergola, 1878 by George Howard, 9th Earl of Carlisle. Private collection.